The minerals and energy sector continues to play a critical role in the Queensland economy with an estimated $64.8 billion contribution to the state’s economy in 2014-15. 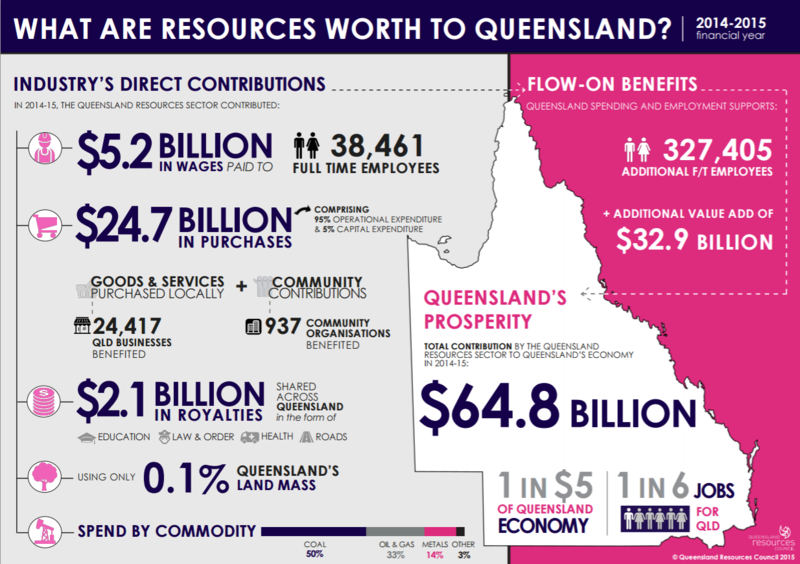 Releasing a state-wide analysis of resources sector spending, Queensland Resources Council chief executive Michael Roche said the sector was directly and indirectly responsible for one in every five dollars in Queensland’s economy and one in every six jobs. Mr Roche launched the QRC’s sixth annual economic contribution report at Parliament House with Treasurer Curtis Pitt. “Despite a slump in commodity prices and the ‘disrupt and delay’ tactics of activist groups, the Queensland resources sector continues to be the lynchpin of the state economy as a generator of jobs, exports, spending and government revenues,” Mr Roche said. “These results signal the beginning of a new phase for the resources sector where we have moved out of a record period of capital expenditure, especially in the gas industry. “While we are now settling back into a more normal phase where operational expenditure dominates, the jobs created, the spending dollars generated and the royalties of $2.1 billion paid to the Queensland Government are still pivotal to the strength of our economy. “The Queensland resources sector remains a tremendous good news story with a strong, ongoing operational future, with our coal and gas sectors well-placed to supply an energy-hungry Asia which is still on a course of rapid modernisation. The 2014-15 analysis aggregates wages and salaries paid, goods and services purchased, community contributions and local/state government taxes and royalties. The raw data is collected at postcode level and is therefore able to be assigned to a geographical (region) and electoral (e.g. local government area) boundaries. “Across the sector, minerals and energy companies spent $32 billion in Queensland with the coal industry contributing 50 percent, oil and gas 33 per cent and metals 14 per cent,” Mr Roche said. “Of greatest significance is that more than 24,000 Queensland businesses were paid for goods and services and that expenditure generated a total ‘value-add’ in Queensland of $64.8 billion and the equivalent of 366,000 full-time jobs. “It should also be noted that resources companies contributed to 937 community organisations around the state which in turn helped them to provide vital services to everyday Queenslanders. “Since the first analysis in 2010, the most striking and consistent result has been the starring role of the Brisbane region as the biggest mining town in Queensland.